The words of the blessing of Enoch, wherewith he blessed the elect ⌈⌈and⌉⌉ righteous, who will be living in the day of tribulation, when all the wicked ⌈⌈and godless⌉⌉ are to be removed. So it would appear that the Book of Enoch was addressed to us. 2. And there arose much godlessness, and they committed fornication, and they were led astray, and became corrupt in all their ways. Semjâzâ taught enchantments, and root-cuttings, Armârôs the resolving of enchantments, Barâqîjâl, (taught) astrology, Kôkabêl the constellations, Ezêqêêl the knowledge of the clouds, 〈Araqiêl the signs of the earth, Shamsiêl the signs of the sun〉, and Sariêl the course of the moon. And as men perished, they cried, and their cry went up to heaven . . .
And so 1 Enoch tells us that these fallen angels taught mankind the skills of seduction, war-making, sorcery, and astrology. And, if we are to believe the myths of Atlantis, they must have also taught genetic modification and the mixing of species. All of these are considered by God to be abominations. Translation by M. Knibb of the Ethiopian text in the S.O.A.S. Library at the University of London. Trans. 1979? R. H. Charles, D.Litt., D.D. Translations of Early Documents Series I: Palestinian Jewish Texts (Pre-Rabbinic). 1917. Richard Laurence, LL.D., Archbishop of Cashel, Translated from an Ehtiopic MS. in the Bodleian Library. 1883. Included in The Nag Hammadi Scriptures: The Revised and Updated Translation of Sacred Gnostic Texts Complete in One Volume. Jeff Daugherty was featured on George Noory’s Coast to Coast AM, where he talked about his theory of how the Bible predicts the Mandela Effect. It is thought that the “he” in this verse is the antichrist. Jeff Daugherty clarifies that the word “apocalypse” means “unveiling.” In fact, the first definition on dictionary.com is “revelation.” It is not about some fiery cataclysm or something to be feared. It is more like the lifting of the veil that New Age sources talk about in which all will be known, and nothing will remain secret. I will have more to say about this soon. I am still typing with one hand. I’ve continued to explore how the Bible might have changed, as I mentioned in my post, Big Changes Afoot. As a result, I finally got around to signing up for Gaia and watching the Wisdom Teachings series by David Wilcock. The information he shares in this series includes a great deal of advanced concepts from the science of physics, including parallel realities. The following is a preview of Episode #26, Parallel Realities. In the series, David refers to the book, The Council of Seven Lights by George Van Tassel. I manged to find a copy of this book. This particular book did not go into the details of time travel, but it did propose a new way of thinking about what time is. For one, time is not a dimension. Also, when we talk about Ascension, this is not about dimensions; rather, it is about densities. This is consistent with the idea that I presented in my post, Reality Is Like Television. Or, to keep it simpler, we could say that reality is like radio, since many radios are still tuned with a dial. The reality we experience is determined by the vibrational frequency that we are tuned into. Vibrational frequency is another way of expressing density. Higher frequencies are more dense. In other words, the waves are closer together with higher frequencies The radio signals are carried on waves whose frequencies correspond to the stations being broadcast. Turning the tuning dial on a radio increases or decreases the frequency that the radio is picking up, thus allowing the listener to tune into the radio station they choose. Another idea that David Wilcock shares is the idea of the “egg carton universe” where the galaxies are aligned along the edges of connected octahedrons. There are many more than what are depicted in the image. This particular idea is actually not new to me. Back in the early 90s, I went to the Griffith Observatory. One of the displays there is a 3D holographic map of the universe. This display was behind a window in a small alcove on the main floor in what is now the Ahmanson Hall of Sky Exhibits. They may have taken this exhibit out, which is unfortunate, because I felt at the time and still do that it was the most important exhibit there. Anyway, the scan of the sky that was being conducted to create the map was not complete. Because of that, it was possible to view into slices of the map. As I looked at it, the arrangement of the stars reminded me of soap bubbles or the walls of biological cells. That appearance would be consistent with the “egg carton universe” concept. To get an idea why knowing about things like this matters, I suggest watching this video of one of David Wilcock’s presentations at the 2016 Contact in the Desert conference in Joshua Tree, California. David Wilcock has a new book coming out in August, The Ascension Mysteries: Revealing the Cosmic Battle Between Good and Evil. I am very much looking forward to the release of this book on August 30, 2016. We may be entering now the future depicted in this video. Perhaps it is not a coincidence that the universe began as a photon? We had a rather unusual earthquake here in the wee hours of June 10, 2016. This is a mainstream report about it. I felt this earthquake from where I’m at, south of Los Angeles and about 150 miles from the epicenter. I was sitting at my desk writing a paper when the house began to creak just a bit, and I felt a very minimal rolling motion. Apparently, this was not the average quake. Dahboo77 noticed a rather peculiar pattern of the tremors on a quake map. David Wilcock speculated about what the earthquake REALLY was toward the end of his most recent post. It has me wondering if there’s a connection between the site of those earthquakes and the Mandela Effect stuff we’ve been experiencing. The earthquakes occurred AFTER I noticed the Bible changes, but a connection is still possible. Meanwhile, the changes noticed and being attributed to that most recent Mandela Effect timeline shift are mounting up. In addition to the Bible changes, people have been noticing differences in logos and brand names, the photos and videos of the JFK assassination, the geography of the planet, and even in family members. Some people lost family members, as in those people never existed in this timeline. Others gained family members. Just search “Mandela Effect” on YouTube, and you’ll find plenty of these stories. So that last timeline jump was very significant. It’s been many years ago now, before 2000, but once upon a time, I kept lovebirds. It began with one, and then I decided that it needed a buddy. It turned out that the two were male and female, and they became a mated pair. Soon, from them, I had another mated pair. I kept all four in a large cage, and they all got along fine. Then one day, the older female passed away. That left her mate with the other pair. It did not take long before the pair became aggressive against the lone male. It became clear that he would have to be removed from the large cage. I had a smaller cage that I used to transport the birds, in the rare instance that became necessary. It really was rather small to live in, and I knew the lone male would need a bigger cage. One morning, I woke up feeling inspired to get the cage that day. It was as if I was impelled by Spirit to do so. With an unusual sense of confidence and purpose, I walked up to lone male’s cage and announced to him that I would be buying a cage that day. I described to him the size of the cage and how much I would pay for it. There was a very definite energy of certainty about the way I did so. I went to a few different stores in town. The price of the cages in the first two stores was more than I intended to pay. In the third store, I browsed around. I looked at the cages in the main display area, but they were not quite what I wanted. Then I looked up into the top stock and noticed a cage way up above the shelving. I asked the storekeeper how much it was. He was actually surprised to see it there. It had no price on it. He thought for a moment, and then offered it at the price I had declared that morning. As I looked at the cage, I saw that it matched the description I had announced to the bird that morning. Then I saw that it was missing a perch! I quickly realized that I had neglected to include the perch as I described the cage that morning. Oops! The shopkeeper found a perch for a small additional price, and I bought the cage. So why do I tell this story? It is an example of manifesting. It is important for me to emphasize that I was feeling an unusual surety that day. It was not simply thinking that I should get a cage. I had been doing that already for a couple of weeks. But this day, I felt impelled by Spirit. It’s as if something clicked into place like a switch in some gear-driven mechanical device. Something weird and wacky has happened and may still be happening. It’s all something that I am struggling to explain to myself. I’m not sure what it means yet, but people’s Bibles have changed. The words have changed. The Bibles don’t have the exact words in them that were in those very same physical books that we have owned for decades. This includes my own Bible that I have owned since 1970. The Lord’s Prayer is different. (Matthew 6:9-13) The lamb is lying down with a different animal. (Isaiah 11:6 and again in Isaiah 65:25) I am a seminary graduate, and I went to church just about every Sunday growing up. I studied these words rather closely and many times. How is it possible that my own books on my own shelves have changed? Perhaps all of this is a fulfillment of Isaiah 65:17, where it says, and I had marked it: “For, behold, I create new heavens and a new earth: and the former shall not be remembered, nor come into mind.” This would suggest that if we wish to examine a particular anomaly, it is necessary to do so immediately because eventually any memory of it will fade and disappear. At the time the videos below were made, all known copies of King James Bibles have the “new” wording. Evidence of the alternate wordings was still being found in some concordances and other documents that referred to the King James Bible; but in time, that may no longer be true. These videos were the first places I learned of this shift. I don’t necessarily agree with these people on other points or the causes of the phenomenon. You can check them out if you wish to, but the tone of them is not where I want to go with them. So what animal did the lamb lie down with in the other timeline? It was a lion. As for the Lord’s Prayer, the verse about debts was previously about trespasses. I received an email that throws an interesting spin on the matter. Someone had asked Yahoo! Answers when the Lord’s Prayer had changed. According to one answer, the wording had changed from debts to trespasses back in the 1960s. The person answering the question recalled having memorized the prayer already and then being told that they had to change what they had memorized. The reason for the change was because the IRS had requested it. This was because they no longer wanted debtors to be allowed to be forgiven. If this is the case, then the recent change from trespasses to debts would be a correction of that anomaly. And, of course, we must consider this theory to be exactly that. This is not an explanation but rather a theory that needs further investigation. It still boggles my mind that this could have propagated to all extant Bibles already in the personal possession of the population. Apparently, there has been some controversy before over whether it was a lion or a wolf, as cited in this article. So how might this have happened, you might ask? I’ve seen it said multiple times that if one can imagine something, there’s a reality where it actually occurs. It might be helpful to look at Science Fiction for some answers. The show Sliders aired from 1995 to 2000. It portrayed a group of adventurers experimenting with a device that allowed them to explore the multiverse. Some episodes portrayed a parallel universe resulting from a change in outcome of events. The plots explored how reality might be different, given those new outcomes. Now, if we can imagine that there actually are sliders operating in this universe, then it would not be so far-fetched that one of them could go back in time and prevent the Vatican from acting on the request of the IRS, thereby avoiding the change in Bibles that so many of us became familiar with. A few people might remember that the Bible was different, but many would not be aware at all. I had a discussion with someone about how this might work. It was thought that it was necessary to enter into someone whose life one had lived before. In other words, the process requires the reentering and reliving, in whole or in part, complete with all of the pains and passions, one of one’s own past lives. Another fictional work describes how this might occur. The third book in the quintet by Madeleine L’Engle, A Swiftly Tilting Planet, hints at a meditative type method that could allow one to go back in time and have some kind of influence on the outcome of a situation. For the most part, to minimize extraneous impacts, the one entering into the past life as a slider would simply observe that life until the critical moment arrived to make the required change. There are a few nonfiction books I know that document experiences with the multiverse. The first I would like to tell you about is Traveling To Parallel Universes by Trish LaSage. This book is full of anecdotal stories, including her own, of people’s experiences with timeline jumps. One case was so extreme that the person discovered she had a different job and a different mate. For another person, timeline jumps occurred with such extreme frequency that the person could not be sure of their history from one day to the next. Usually, the new timeline becomes the new normal. Having myself discovered on at least one occasion that my own history was not what I thought, I now have a more compassionate view when my memory of events differs from someone else’s. It is actually possible that we are both right. Another book, Quantum Jumps: An Extraordinary Science of Happiness and Prosperity by Cynthia Sue Larson, explains a theory of how we might change timelines. Simply put, we decide for something else. But to get the best idea of what timelines could possibly be, I recommend Conversations with Nostradamus by Dolores Cannon. In this book, Nostradamus himself describes to Dolores Cannon via conversation through past life regression how he saw timelines when he scryed them with a magic mirror that had been given to him. He told how his attention would be drawn to tangles in the timelines to see what might cause them. He also unravels the mysteries of what those cryptic quatrains of his actually mean. It is worth noting that when clients undergo past life regressions utilizing Dolores Cannon’s techniques, healing often occurs, possibly in both the current life and in the past life. In the last week, I found a book that lays out rather well another way one might influence at least one’s future timeline: Dissolve The Problem: by Shifting Physical Reality by Richard Dotts. This book lays out a three-step process: acknowledgement of the way things are now, imagining an alternate reality in which the desired thing is true, and staying in the imagination of that reality as long as possible. The process appears to be Law of Attraction on steroids. On another interesting note, I felt it necessary to re-read the book by Madeleine L’Engle, A Wrinkle in Time last week. Now I see why! The concept of the method is somewhat similar to what was seen in the movie Inception. I am doing some looking around to see if there might be a connection between timeline jumping and past life regression, but I have not found a clear link yet. I have another theory about the Bible changes. This came while listening to an interview by Tom Evans, Talking Temporally with Anne Jirsch. It starts to get very interesting around minute 40. The Bible changes could be a signalling device from our descendants in the future. They want to get our attention because they need us to make changes. You can find out more about Anne Jirsch here. She has posted some processes for connecting with our future selves here. It seems that more and more people are noticing these timeline jumps, as mentioned in the article by Zen Gardener, Boldly Engaging the Ongoing Adventure. The linked articles within this article are worth reading as well. I like his take on the phenomenon. He reminds us that at least some of us asked for this experience when we asked to go into higher dimensions. He invites us to consider it an adventure to live in the new paradigm of multidimensionality. I held this story back for a long time because I did not want it to seem that I was bragging. But now, it seems to me that stories like this are needed. Big changes are needed on this planet right now, and this is a story of doing something big. I had the experience in 1999 of working with a hurricane in a meditative shamanic way. While I may have been doing what I was doing all by myself, I was not the only person working on this storm. I do not make any claim to be sole cause of any effects. It was Hurricane Floyd, and it was heading for Miami at the time this story begins. Not only was the storm packing winds of near Category 5 force, but it was also a tremendously huge storm packing lots of rain. As this story begins, I was chatting on the computer at the time with someone in Miami. He was telling about how the hurricane was closing in on them there. There was great concern due to the size and strength of this storm. I pulled up the tracking and prediction information for Hurricane Floyd and realized just how dire the situation was. Florida is little more than an oversized sand bar. Most of the state is flat and barely above sea level. Between the high winds, the torrential rain, and the storm-driven waves of the ocean, the potential destruction facing Florida that night was catastrophic. I had learned in childhood the story of Jesus calming the storm and the sea. (Mark 4:35-41) I also knew that Jesus had told us that we would be able to do what he had done and even greater. (John 14:12) By this time in 1999, I was also taking classes at the Learning Light Foundation and studying A Course In Miracles. I decided to see what could be done about Hurricane Floyd. I thought about how I could work on the storm. My faith was not such that I could believe that I could suddenly stop a storm in its tracks. I figured that it would be best and most believable to me to work with the natural laws. As I thought about it, it seemed that the most natural thing would be for the storm to slow and turn. That was the strategy that I decided to pursue in my work on the storm. I went into meditation and called upon the angels to help me with this project. I looked at the weather maps and imagined a shift in the jet stream that might push Hurricane Floyd away from the coast. I visualized the slowing of the spin of the storm, and I commanded the angels to slow the hurricane and turn it north. I imagined and visualized in my mind a new path for the hurricane that would keep it from making landfall at its full force. I spent quite some time at this task. I recall still being there working on the storm by the time that the eye of the hurricane was as far north as Cape Canaveral. Try as I might, I could not imagine a path in which the hurricane entirely missed the coast, but I was able to imagine a path that would have Hurricane Floyd making landfall well up the coast at a much reduced strength. This is exactly as it came to be. Hurricane Floyd made landfall in North Carolina as a Category 2 storm, exactly where I visualized that it would. 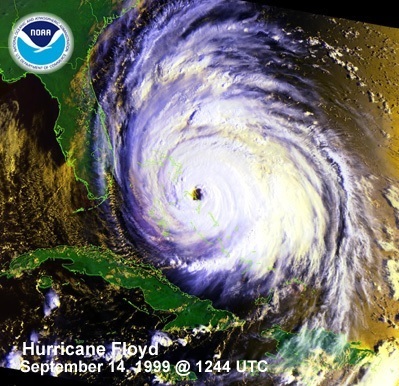 Hurricane Floyd was still a very destructive storm there, but the destruction was much less than it might have been in Florida. I checked in with other light workers I knew to see if anyone else had been working with the hurricane. It turned out that I was able to find a few others who had done so. I told them about my experience of visualizing the path of the hurricane. They told me that they had been using similar methods with the hurricane and had pretty much the same experience with it as well. They could not get the hurricane to entirely avoid hitting land, either. The place where we all imagined it hitting land was where it actually did so. I have an odd little story that goes way back to the early 1980s. It is yet another one of those mundane little stories in which something out of the ordinary occurs which to this day defies explanation. 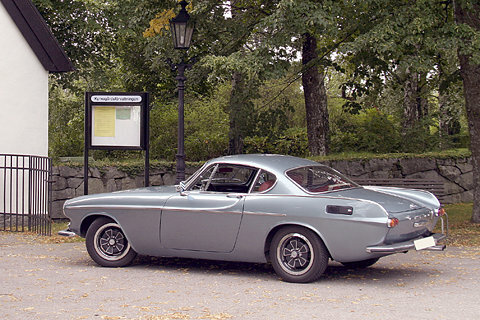 Back then, I had a Volvo 1800E. It was a rather unusual sports coupe, especially in Utah Valley where I was living at the time. The area was dominated by a steel factory, and so the local residents had a strong preference for American cars. Somehow, the tail light lens got broken. In a futile attempt to save money on a replacement, I decided to look for a replacement at the local junk yards. I sort of knew this would be a long shot, given the relatively low population of the valley and the rarity of the car, but I decided to give it a try anyway. I had just come out from the office of one of the junk yards. I had opened the car door and was tossing the broken tail light lens onto the floor of the back seat when I experience some kind of “blip” in consciousness, and then the broken tail light lens was gone. I looked throughout the car, under it, and I even went back into the junk yard office to ask if I might have left the tail light lens there. The tail light lens was nowhere to be found. As I backed out of my parking space, I also looked where I had been to see if I might have missed it when looking under the car. That tail light lens was never seen again. That event has ever since then been a source of wonder for me. Some years later, I attended classes at the Learning Light Foundation. This facility was also the site for a MUFON group. Consequently, several of the other students I attended class with also attended the MUFON meetings. Through them and other reading material, I learned some of the hallmarks of an alien experience, one of which is the type of blip in consciousness that I had experienced that day in Utah while visiting junk yards. A couple of years ago, I did a past life regression session with someone who had been trained by Dolores Cannon. In her methodology, after the past lives have been explored, the subconscious [more properly the “superconscious”] is called in. The hypnotist then asks questions that have been prepared by the client. I asked about the incident with the tail light lens. It was confirmed that it was an ET-related event, but I was not allowed to learn any of the details of it. Apparently, during the course of that event, the tail light lens was misplaced and did not make it back with me to the point of origin of the event. An apology was given in the session for the missing tail light lens. Something like this defies proof. I will never know for sure exactly what happened to the tail light lens—or to me, for that matter—at least not during this lifetime. For now, information gathered in the regression session will have to suffice as an explanation.